It had to be pizza. 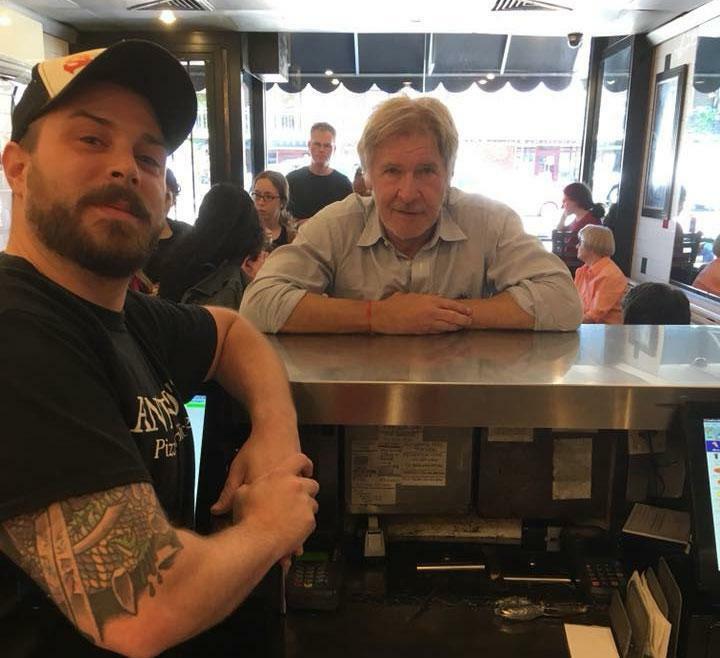 Harrison Ford, the actor most prominently known for his roles as Han Solo in “Star Wars” and the titular character in “Indiana Jones,” was spotted eating at an Amherst pizza shop Tuesday. Ford, his wife — “Ally McBeal” actress Calista Flockhart — and one of his sons were at Antonio’s Pizza on North Pleasant Street on Tuesday morning. Jay Carreiro, a regional manager who was working at the time, said Ford and his family came in around 11 a.m. and ordered: Two slices — one pepperoni sausage and one tomato basil — for Ford himself; a slice of broccoli pizza for Flockhart; and a couple of cheese slices for their son. In fact, Ford went up to some of the customers and initiated some conversations himself, Carreiro said, and even signed a plate for one older woman. After he was done eating, Ford went back up to the counter and made some small talk with Carreiro. “He said he enjoyed the pizza — that’s the first thing I asked him,” he said. The two also had a conversation about David Blaine, the pizza shop manager said, referencing when the magician performed some tricks in Ford’s house. Afterward, Carreiro said he asked Ford for a photo: “I was like, ‘Hey, I gotta ask — I wouldn’t respect myself if I didn’t ask.’ And he said, ‘Well, we can’t have that,’ ” and proceeded to pose for the picture. The photo was posted to the Antonio’s Pizza Facebook page shortly after. By around 4:45 p.m., it had more than 2,100 likes, 564 shares, and 239 comments. The town of Amherst also shared it on the municipality’s official Twitter account.